IOX2 is a potent inhibitor of HIF-1α prolyl hydroxylase-2 (PHD2) with IC50 of 21 nM in a cell-free assay, >100-fold selectivity over JMJD2A, JMJD2C, JMJD2E, JMJD3, or the 2OG oxygenase FIH. NHEK and NHDF are cultivated under normoxic (N) and hypoxic (H) conditions in the presence of IOX2 (50 μM), or vehicle control (DMSO). 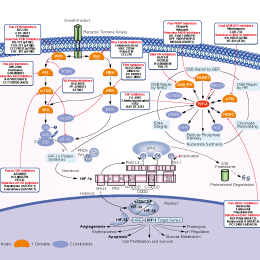 b HIF-1α levels are analyzed in cell extracts of NHEK (4 h) and NHDF (24 h) by immunoblotting with cellular β-actin as loading control. c Subcellular localization of HIF-1α is examined by immunoblotting analysis of HIF-1α in nuclear (Nu) and cytoplasmic (Cy) fractions with β-tubulin as cytosolic loading control. Arch Toxicol, 2016, 90(5):1141-50. IOX2 purchased from Selleck. Immunocytochemistry analysis of HIF-1α in NHEK and NHDF after incubation with a PHD-2 inhibitor, IOX2 (50 μM), or vehicle control (DMSO) for 4 h. Scale bars 100 μm. Arch Toxicol, 2015, 10.1007/s00204-015-1549-y . IOX2 purchased from Selleck. Murray JK, et al. J Comb Chem, 2010, 12(5), 676-686. Tian YM, et al. J Biol Chem, 2011, 286(15), 13041-13051. Defactinib (VS-6063, PF-04554878) is a selective, and orally active FAK inhibitor. Phase 2. 2-Methoxyestradiol (2-MeOE2) depolymerizes microtubules and blocks HIF-1α nuclear accumulation and HIF-transcriptional activity. Phase 2. Roxadustat (FG-4592) is an HIF-α prolyl hydroxylase inhibitor in a cell-free assay, stabilizes HIF-2 and induces EPO production. Phase 3. 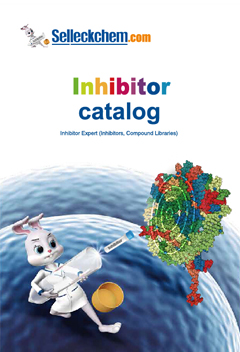 BAY 87-2243 is a potent and selective hypoxia-inducible factor-1 (HIF-1) inhibitor. Phase 1. Imatinib Mesylate (STI571) is an orally bioavailability mesylate salt of Imatinib, which is a multi-target inhibitor of v-Abl, c-Kit and PDGFR with IC50 of 0.6 μM, 0.1 μM and 0.1 μM in cell-free or cell-based assays, respectively.